The wealth of tools, kits, and suites offering different facets of SEO and general website management is growing daily and choosing between them becomes increasingly difficult. There are many programs and apps that offer a single specialist service at varying financial obligation, few, however, are offering an expansive range of services under one umbrella the way that Kerboo does. Kerboo is a master suite that covers almost every aspect of your website maintenance and SEO optimization. It has a wide range of features with great customization meaning you can make it work for you on the schedule that you can manage. 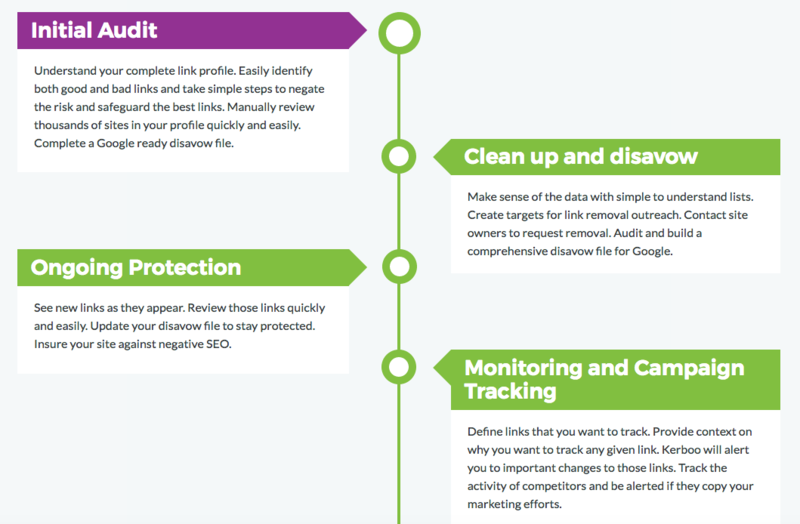 Previously known as LinkRisk the company have recently rebranded but still use the LinkRisk software and name for their website auditing tool. The main features in the Kerboo toolbox are the audit which checks a websites backlink profile, peek which allows you to gather detailed information on websites and the people behind them, monitoring which allows you to keep track of the health of links on your site and set up daily or monthly alerts, investigate which brings up a list of sites in a handy intuitive visual graph to ease decision making and finally the rankings tool which will keep track of a sites rank across 26 different countries and generate a weekly or monthly report. The company behind Kerboo respond to feedback and the software has undergone major improvement based on suggestions given by its users. Attention like this to the evolution of its service and the satisfaction of its users is one of the major reasons it has established itself as such an indispensable tool. This is a professional product and so the pricing reflects that. Kerboo licenses are charged on a monthly basis depending on how much you need from it. It packages itself into boxes roughly based on the size of the agency with a small agency with around 3 team members costing £349 a month. If you work by yourself as a freelancer, the freelancer package is only $129 a month. The product is sure to provide results and for new accounts, they do offer a 25-day money back guarantee if you are not completely satisfied. It can take a little while for you to get used to the tool and whilst the majority of Kerboo and its features are very streamlined and intuitive you may be a little overwhelmed by it all, to begin with. There are some guides and assistance provided on the website but getting stuck in playing around with the platform is the best way to learn. Generating reports and extracting data from the software is straightforward and even a novice can use it to pass along the valuable data it provides to their clients. Kerboo is not for the novice, this is a professional tool for the higher end of the market. If you are looking for something simple and cheap then you should look elsewhere. You do get value for money with Kerboo but with the wealth of free software out there offering a slice of what Kerboo does it could be that you’re paying for the convenience of having it all packaged together for you. A tech-savvy searcher could probably piece together an array of cheaper/free to use software that provides all the same services. But who has time for that? It sounds like this is some advanced software. Would you recommend something like this to a small business owner that is just getting his website started and wants to see how things are going? I wouldn’t want anything that is too hard to handle, especially when you pay good money for it.